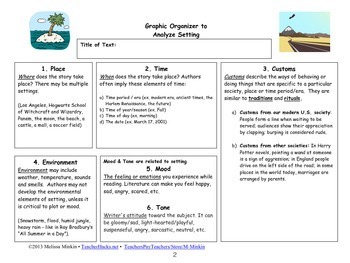 *Graphic Organizer with definitions and examples for the four elements of setting: 1) place, 2) time, 3) environment, 4) customs. Two other boxes help students understand how 5) mood and 6) tone, while not always considered part of setting, are influenced by it. 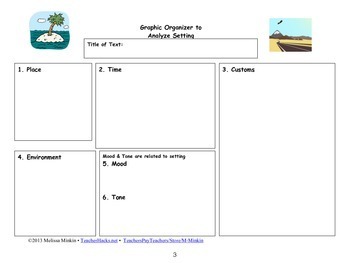 The packet also includes a blank version of the graphic organizer (without the definitions and examples). Both graphic-rich documents print well in color, and black and white. 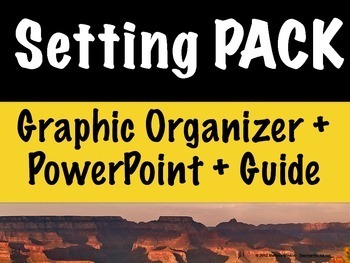 *PowerPoint - with 20 setting-rich photographs to give students extra practice analyzing setting. The 20 images convey a variety of locations, climates, times of day, seasons, time periods (including five historical images), moods and tones. *Teacher’s Guide with suggested uses and prompts for facilitating discussion of images.